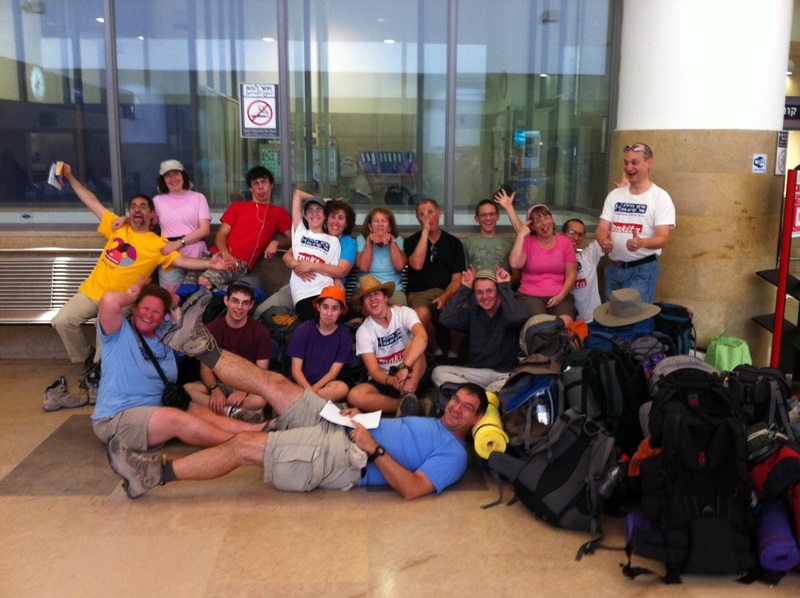 Over the past week, I embarked with 17 others on a classic Israeli journey called Yam L’Yam. The trip starts at the Mediterranean Sea and 85 or so kilometers later (about 55 miles) ends at the Sea of Galilee. Our goal – to have a great time, enjoying the beauty of Israel and the company of friends as we traveled across Israel. We planned for the last few months, some of our group went on practice hikes with packed bags on Fridays, we had planning meetings and google docs and yahoo groups. We made reservations, gathered up the gear we thought we needed, checked the maps, read blogs. The hike is generally done in 3, 4, or 5 days. (Although I have a friend who has a friend who said he did it in one, 22-hour day – if it sounds like a fish tale, it probably is one.) Since our group ranged in age from 13 to 60, and we wanted to do it in one week so we could be home for Shabbat, we decided to plan the 4 day option – Monday through Thursday. We would use Sunday as a travel day to get to the beginning of the trail, and hire a mini-bus to take us home on Thursday night. This expedition would take the place of our annual summer “Friends’ Vacation”, a time that we generally dedicate to hiking, touring and having a good time together. This trip would vary from our standard vacation – we would be sleeping outside most nights, carrying our gear, and relying on our wits and our feet to carry us along. No one brought a car. requires a good amount of patience and empathy. Building community is one of my life’s focuses. I came to Israel seeking to be a part of a community, and have found satisfaction for the last 19 years in helping to build community locally in Chashmonaim and nationally. I build webs of people who genuinely care about each other, wherever I go and with whomever I meet. Much of my work over the past 19 years, especially my work with Taglit/Birthright, focuses on the importance of community affiliation. Why is community important? Numerous studies show that connection to community lengthens our lives by as much as 14 years! Despite this, and despite the flourishing of electronic communities, people today feel less connected than ever. Average Americans claim to have 1.5 friends on average despite what their Facebook account tells them. Sad. As we went through our trek, our group had to deal with many challenges – the heat, the lack of water, our crazily heavy packs, mosquitoes, wild boars, naked Nachmanites at 2:00 A.M. There were fears, anger, and disappointment. Through it all, though, we stuck together as a group, drawing on each other’s strengths to pull us through the challenges. We figured out which changes to our plans needed to be made in order to accomplish our goals – not just our individual goals, but our group goals. People told us that attempting this hike with so many people was foolish and was sure to end in failure. And maybe for the ME generational outlook, the way our Sea to Sea trek ended would be considered a “failure”. Those of us on the trek understood it much differently. It was a most daring thing and ended in complete success. Ooh, I loved that hike! I really want to do it again, albeit the “old way” (Kinneret to Med. Sea) – hopefully one day… What was your wild boar experience?